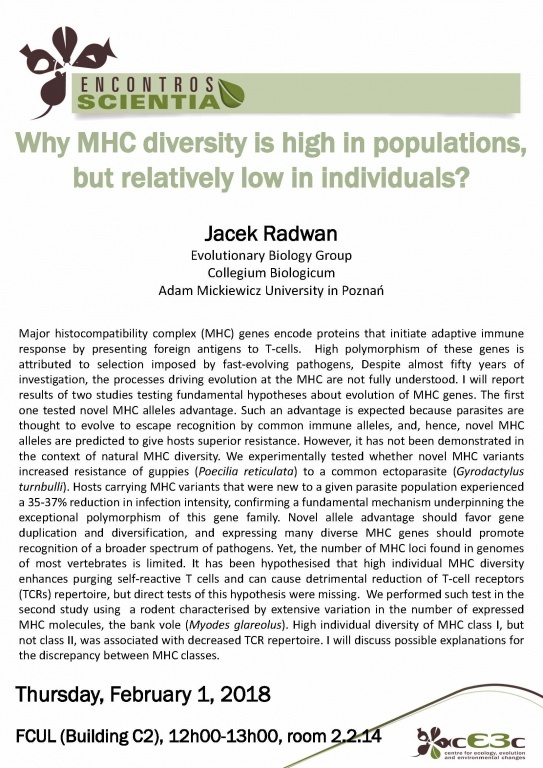 Why MHC diversity is high in populations, but relatively low in individuals? Major histocompatibility complex (MHC) genes encode proteins that initiate adaptive immune response by presenting foreign antigens to T-cells. High polymorphism of these genes is attributed to selection imposed by fast-evolving pathogens, Despite almost fifty years of investigation, the processes driving evolution at the MHC are not fully understood. I will report results of two studies testing fundamental hypotheses about evolution of MHC genes. The first one tested novel MHC alleles advantage. Such an advantage is expected because parasites are thought to evolve to escape recognition by common immune alleles, and, hence, novel MHC alleles are predicted to give hosts superior resistance. However, it has not been demonstrated in the context of natural MHC diversity. We experimentally tested whether novel MHC variants increased resistance of guppies (Poecilia reticulata) to a common ectoparasite (Gyrodactylus turnbulli). Hosts carrying MHC variants that were new to a given parasite population experienced a 35-37% reduction in infection intensity, confirming a fundamental mechanism underpinning the exceptional polymorphism of this gene family. Novel allele advantage should favor gene duplication and diversification, and expressing many diverse MHC genes should promote recognition of a broader spectrum of pathogens. Yet, the number of MHC loci found in genomes of most vertebrates is limited. It has been hypothesised that high individual MHC diversity enhances purging self-reactive T cells and can cause detrimental reduction of T-cell receptors (TCRs) repertoire, but direct tests of this hypothesis were missing. We performed such test in the second study using a rodent characterised by extensive variation in the number of expressed MHC molecules, the bank vole (Myodes glareolus). High individual diversity of MHC class I, but not class II, was associated with decreased TCR repertoire. I will discuss possible explanations for the discrepancy between MHC classes.